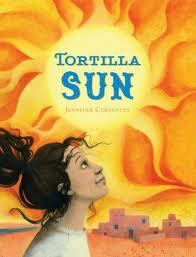 Last July, I discovered Tortilla Sun by Jennifer Cervantes. (To read my review, click here.) There truly was something magical about this book. When I finished reading it, I just knew that I had to share it with my students. As I read the book aloud to one of our fourth grade classes, I became excited about the connection the students were making to the characters in the story. I then started giving copies way to teachers and parent volunteers who in turn became excited about the book. Of course, one thing led to another and before you knew it, we were planning a Literacy Café. Our Café first opened it's doors on Monday, November 1, 2010. We welcomed 34 fourth graders into our Café. We were well prepared and had many enthusiastic volunteers to assist us with the activities. Our hosts led children through activities that pulled out key concepts in the book and allowed children to interact with those ideas at a different level. Children used their senses while nibbling on apple empanadas to talk about sensory adjectives. At another table, children played with the symbols in the story in order to create a visual representation of the book. And at yet another table children wrote poems about the characters. When they finished, each child received a homemade tortilla with butter and honey just like Izzy eats them. However, we weren't through with Tortilla Sun or with Literacy Cafés. We learned so much from that first experience and have since put on over a dozen more Cafés centered around different books. When word got out about the success of Tortilla Sun, I had requests from other teachers to read the book aloud to their classes and to hold another Café. While I read to the students, my Literacy Café partner Angie busily revised activities. We discussed other ways to explore the themes. Tweaked activities that didn't work as effectively and tried to add in some other ways to work with the concepts in the book. This time we even added in a session of folklorico dancing. And of course our bakery bought apple empanadas became homemade empanadas, and Angie perfected her tortilla making. Nana would be proud. What we also learned through the experience is that paying attention to details is critical. When children arrive in the Café, we want them to be transported into the book. A piñata hanging from the ceiling or black crepe paper hanging from the door or even the smell of tortillas warming help children feel more a part of the story. Was this Café better than the first one? Yes, and no! Both were wonderful on their own. Both inspired children and helped them see books in a new way. And also both times we learned things that would help us make another Café even better. Take a look at this short video to get a better feel for the whole event. Here is Jennifer Cervantes reading from Tortilla Sun at an author event in Glendale, CA. I had a blast meeting her and telling her how much I loved her book. For more information about our Literacy Cafés, you can check out my blog post here. To visit Jennifer Cervantes website, click here. In "Jennifer Cervantes", "Literacy Cafés", "Tortilla Sun"